There’s still time to get tickets for the September 20 Ig Nobel Prize award ceremony at Harvard, where ten researchers will receive recognition for unusual discoveries. 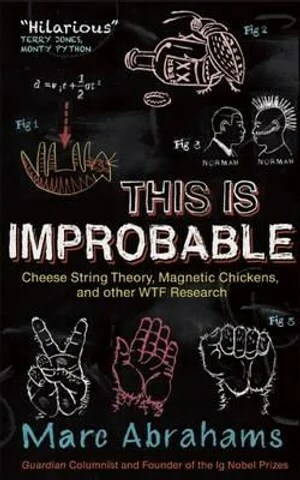 The prizes are the brainchild of Marc Abrahams, editor and co-founder of “The Annals of Improbable Research” and author of a new book, This is Improbable: Cheese String Theory, Magnetic Chickens and Other WTF Research. The ten Ig Nobel winners, whose identity has not been revealed, will receive their certificates from “real” Nobel laureates. According to Abrahams, some dedicated scientists hold awards in both categories. He cites Andre Geim and Michael Berry, two UK physicists, who won an Ig Nobel in 2000 for using magnets to levitate a frog. Ten years later, Geim and a student won a Nobel prize for producing graphene (two-dimensional carbon) in sufficient quantities to study. Dr. Elena Bodnar, with her Ig Nobel prize winning bra that quickly converts to a protective face mask. Dr. Richard Gustafson for research: “The failure of self-administered automobile-engine-supplied-electric-shock treatment for rattlesnake envenomation resulting from patient’s pet rattlesnake biting the patient on the lip. Basile Audoly and Sebastien Neukirch won a 2006 Ig Nobel for research on why spaghetti, when broken, often splits into more than two pieces. Dan Mayer for an article on the medical effects of sword swallowing. Don Featherstone, creator of the pink plastic flamenco. Glenda Browne of Blaxland, Australia, for her study of the word “the” and the problems it creates for people who try to alphabetize things. This entry was posted in Contests, Current Events, humor, Nature, Science and tagged 2012, contests, current events, humor, Ig Nobel prizes, Nature, Science. Bookmark the permalink. Ah. Structured Procrastination. Now that’s something to which I can relate. Notice how many days it took me to get caught up on my blog reading? The web side has a link to past winners over the years, and there were way too many entertaining topics to list.